One of the most popular halogen work lamps worldwide is a round lamp with an ergonomic integrated handle and independent switch. NARVA has taken a quantum leap forward and developed a new version of the round work lamp utilising the latest L.E.D technology and it’s now available in New Zealand. The all new Senator II makes use of the distinctive style and high power L.E.D technology, along with other advanced features. 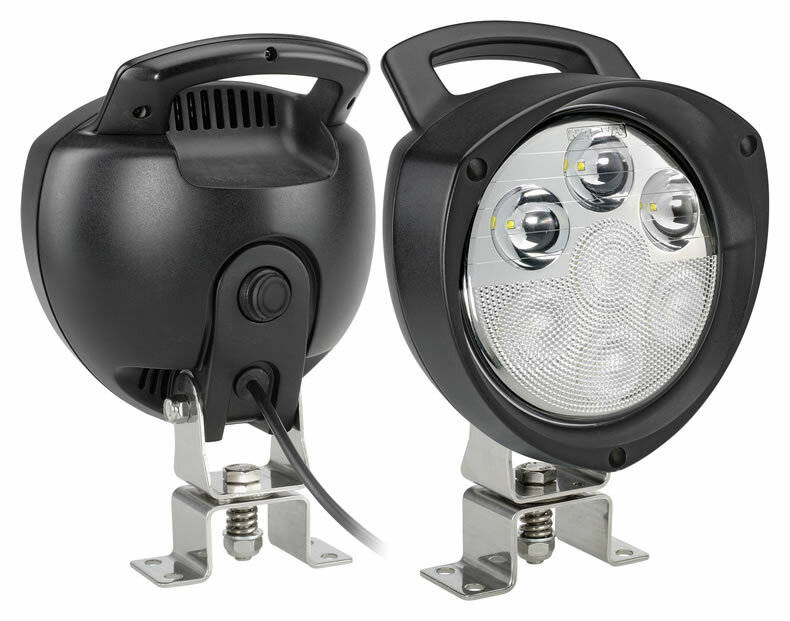 The new lamp challenges the traditional halogen lamp in both performance and price and is a ‘must have’ for applications on council, transport and contractor trucks, as well as mining, forestry and agricultural equipment. NARVA’s Senator II, with powerful 3 Watt L.E.D’s, is available in either a powerful flood or hybrid flood beam pattern producing a smooth and even 2000 lumen light output. Where more light is required a high powered 5 Watt version is available in hybrid flood beam, delivering an outstanding light output of 3200 lumen, approaching that of H.I.D light. The hybrid optic lens combines the performance of a flood beam with a spot beam, delivering a versatile light pattern ideal for a wide range of applications. The housing is ventilated to effectively cool the fully sealed internal L.E.D module, maximising the performance and life of the L.E.D bulbs. The unique design of the housing allows water to pass through without affecting the internal module, which is sealed to IP66 standard. Given the extreme conditions in which these lamps operate, the housing of this exciting new lamp is made of impact resistant reinforced nylon fitted with a quality rocker switch covered by a weatherproof boot. The lens is virtually unbreakable polycarbonate and the stainless steel mounting hardware is complemented by a pressurised spring, allowing the lamp to swivel easily without any requirement for tools. Senator II is also available with a magnetic base with rubber suction pads to prevent the magnet scratching the surface of a vehicle of equipment. This model comes fitted with a 2m spiral lead and cigarette lighter / Merit plug. NARVA Senator II lamps are available from leading automotive outlets throughout New Zealand under Part Nos. 72474 – 72479.